CM Bethlehem Residents Celebrate Lifelong Jubilee! Recently the Matura team of stylists: Kelly Savoia, Crystal Carey, Michele McEnery and Field Manager Cathy Cox joined in the Country Meadows @Bethlehem annual jubilee for residents. 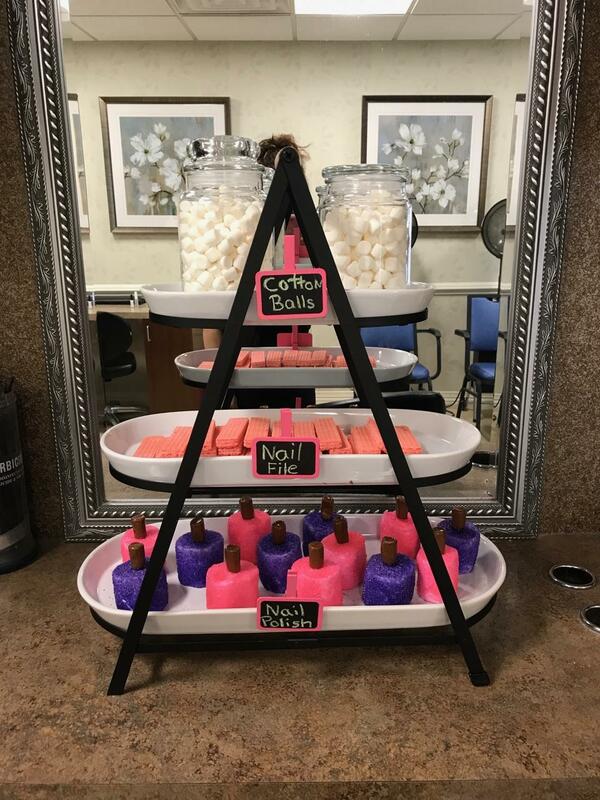 This year, our own talented Michelle McEnery created an adorable and delicious nail tower of treats featuring nail polish bottle, nail files and cotton balls crafted from candies and cookies. Matura Salon and provided nail art manicures in Bldg #3, warm hand massages in Bldg #2 and personalized hand massages in Connections Memory Support. Special thanks to Kelly who visited the rooms of Connections residents to make sure the experience was comfortable and enjoyable for all. Residents were especiallyy appreciate of the hand massage services provided by Crystal and Cathy who helped to ease some of their aches and pains.